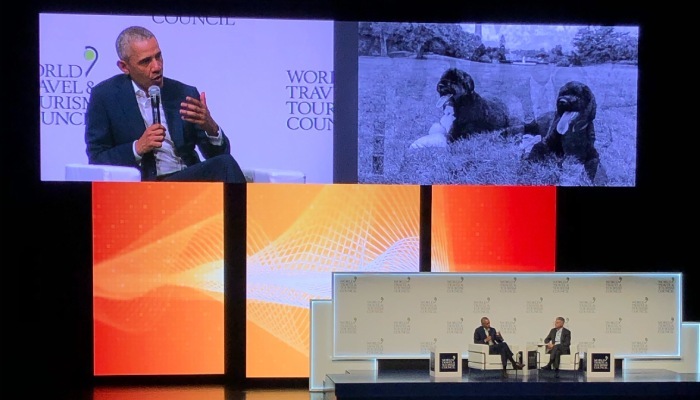 Youth and ‘the younger generation’ were among the most-used buzzwords of the World Travel & Tourism Council’s 2019 Global Summit- not least by the Summit’s distinguished guest of honour, former US President Barack Obama. Hosted in the city of Seville, Spain, attendees of the Global Summit warmly welcomed President Obama for an intimate and personal discussion with Chris Nassetta, Hilton President & CEO and WTTC Chairman, on the social, cultural, and economic value of tourism. The conversation also touched on much more, including climate change, borders, government facilitation of tourism, the current state of media, and the impact media and the Internet have had in enabling people to surround themselves with opinions and perspectives that are just like your own. When asked about his most memorable travel experiences, President Obama reflected on the many experiences he has had abroad as President, but also as a young traveller. Most cherished, however, is the time he has spent travelling with his children. President Obama offered a friendly, but clear warning to destinations that want to attract young visitors, particularly young women travelling. When asked by Chris Nassetta if there was anything that he missed about travelling, President Obama joked about having to wait on the tarmac or in traffic, unlike his experiences with Air Force One or a presidential motorcade. More seriously, he referred to the running joke of media and the general public while in office that he was always on vacation when he went abroad, but really this was about people-to-people diplomacy. Read more about the World Travel & Tourism Council and its annual Global Summit.